Drag and drop the arts in the tree of knowledge. Memorize 5 guitar chords. Then try to recreate a song. Sort the famous Vincent van Gogh painting. Complete a famous Sandro Botticelli painting. Arrange the famous Leonardo da Vinci painting. Sort the famous Rembrandt van Rijn painting. 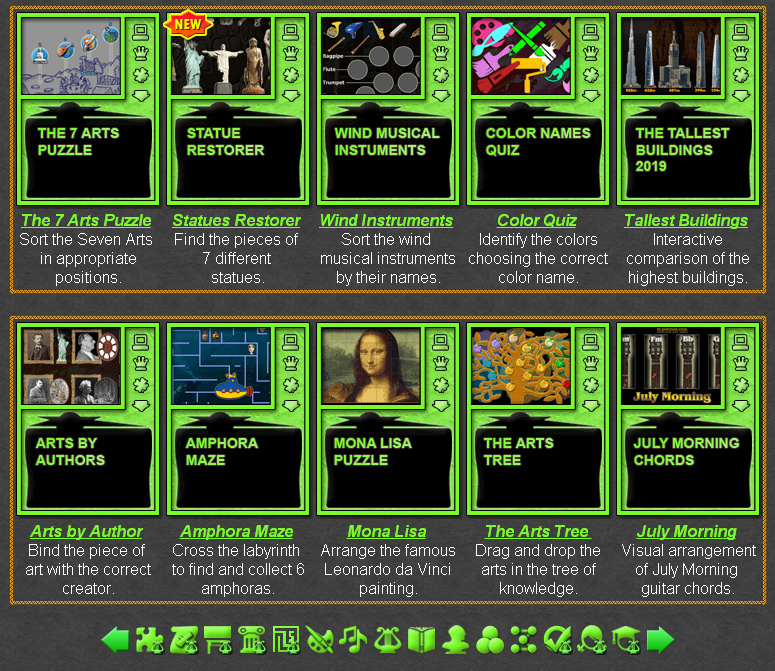 Free online educational games about arts. Art games to explore and study creativity. 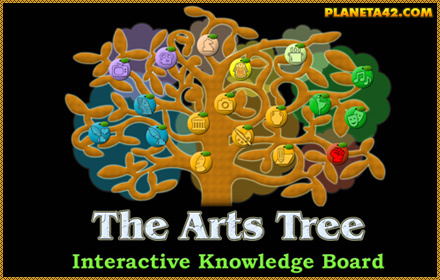 The art knowledge games are small flash games, up to 1 MB, which include puzzles, mosaics, tile games and tests for learning history of arts and music, as well as basic knowledge about different creativity directions. The art learning games are suitable tools for education, examination, references and recreation. They may be played in schools, at home, in classes. Art Types Tree - Sort the types of arts on the tree of knowledge. 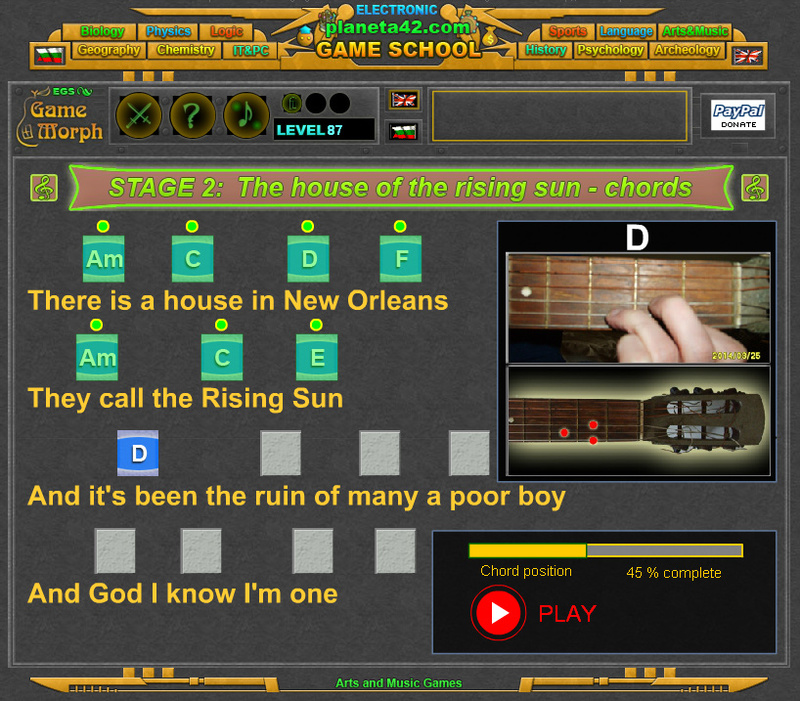 Guitar Explorer - Interactive learning of House of the Rising Sun song guitar chords. Guitar Explorer 2 - Interactive learning of July Morning song guitar chords. Mona Lisa Puzzle - 40 squares rotating puzzle with painting of Leonardo da Vinci. Starry Night Puzzle - 5x8 squares puzzle with painting of Vincent van Gogh. Birth of Venus Puzzle - Sort the puzzle with the famous painting of Sandro Botticelli. Night Watch Puzzle - Rotate the squares to reveal a famous painting of Rembrandt. The Last Supper Puzzle - Sort the puzzle with the painting of Leonardo da Vinci online. The "Interactive Creativity Atelier" is a free online education web site with small games, tests and puzzles played online in the web browser. All games are free and run on medium class computers, tablets and laptops, with installed flash player. They reward +1 Knowledge Level for every won game. Fun art educational language games, suitable for e-learning, online lessons and interactive classes. The collectible games (download versions), goes with build in player, but the levels are not saved on the website. Educational Multimedia Arts for all ages. Free to play and download without registration. Fun art games.